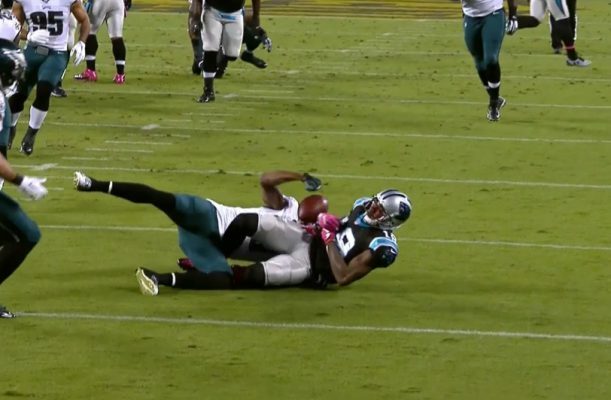 Philadelphia lost on the road to the Carolina Panthers Sunday. That shouldn’t be such a huge shock. Carolina is undefeated after seven games, with an excellent defense featuring two of the league’s best linebackers (Luke Kuechly and Thomas Davis) and the NFL’s hottest young cornerback (Josh Norman). On offense, they have a creative running game, featuring two stars that Chip Kelly knows all too well: Jonathan Stewart, who was Chip’s first great RB at Oregon, and Cam Newton, who bedeviled the Ducks in the 2010 National Championship Game. Vegas odds makers favored the Panthers by three to eight points. 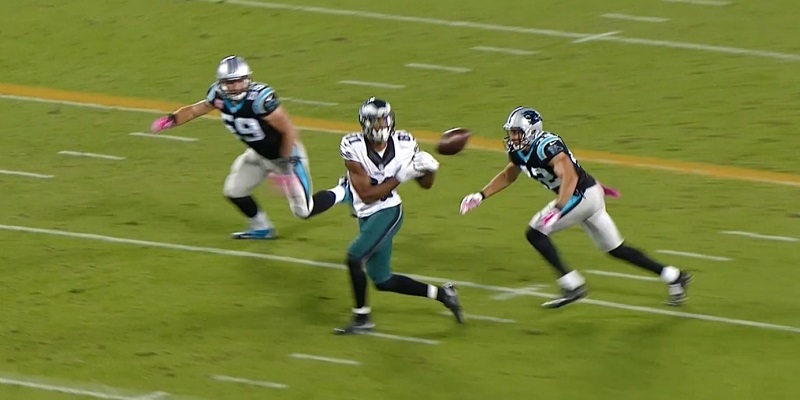 Nolan Carroll pulls the ball out for an interception. Among Eagles fans and writers, naturally, the result was despair. The Birds are 3-4 now after all of Chip’s big off-season reshuffling. In the Panthers game, they blew a great chance to steal a key road game by making several unforced errors, including two drive-killing penalties and at least seven dropped, catchable passes. Ryan Mathews’ 63-yard touchdown run. In the process, they wasted Sam Bradford‘s best full game of the year, 177 yards on the ground and three interceptions of Cam Newton (who had only four combined in the previous five games, two of those by Seattle). Bradford wasn’t perfect — he attempted no deep passes at all until the Hail Mary on the final play, and didn’t see some receivers open for big gains. But he was a lot better. Bradford certainly deserves credit for handling a very tough pass rush. Carolina’s trade of a sixth-round pick for 33-year-old DE Jared Allen, the NFL’s all-time sack leader, is looking pretty smart, and DT Kawann Short has thrived as offensive lines have to divide their attention. The Panthers are eighth in the league with 18 sacks, and have played one fewer game than most teams due to their bye. The Eagles QB even ran on a couple of plays, picking up one tough first down by putting his shoulder down and bursting between two Panthers (who collided with each other, surprised at his speed). It’s a hot topic now why the Eagles can’t get their passing game together. Bradford haters point to his miserable statistics, but drops and interceptions that bounce off receivers’ hands will destroy a QB’s stats. It’s also hard to throw long if your receivers aren’t open or you’re getting sacked, as Sam was five times Sunday night. On the other hand, Bradford has bombed away a couple games this year and the results were not pretty. His long throws often fall short, leading to easy interceptions. And many of his 16 drops this year have been passes that were a little off — catchable by many receivers, but maybe not these. I’ll be giving my bye week evaluation next Thursday, and I don’t want to jump the gun here. But it’s worth remembering that Kelly explicitly set out to better balance the money invested on the offense and defense of this team. That’s why he got rid of high-priced stars such as LeSean McCoy and DeSean Jackson (neither of whom has done much of anything this year), and why he refused to top Kansas City’s $11 million offer to WR Jeremy Maclin (who has been solid but not special for the Chiefs). 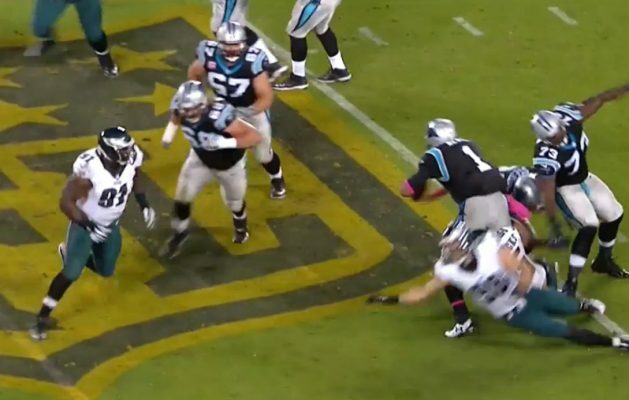 Cam Newton getting sacked by Mychal Kendricks. The strategy worked, in the big picture. The Eagles have a top five defense built around young, athletic players, and it will only get better as Mychal Kendricks and Kiko Alonso recover from their injuries. But these bargain-bin receivers — a mix of raw rookies and fading veterans — clearly need easier-than-normal passes to avoid drops, and Sam Bradford has not been able to deliver the accuracy he was acquired for. It will be a big challenge for Kelly to find the narrow mix of play calls that will be unpredictable enough to get players open without forcing Sam to make perfect, tricky throws that he is currently not capable of. The Eagles are just not that good yet, where “that good” means beating an undefeated team in their home stadium. They may well be good enough to win the crummy NFC East — hell, a losing record might take home that crown, and Dallas’ fourth loss in a row boosted the Eagles’ chances a lot. The question is whether they can improve enough in their remaining nine games to avoid getting destroyed in the first round of the playoffs, if they even get there. The defense and special teams are ready, but someone on the offense needs to step up.